Article originally published on The Football Collective here. Where do you find a Sporting Director in football? We have seen a growing media lens and attention given to the Sporting Director role in football (or Director of Football, Technical Director, Head of Football Operations as the role may also be known). Whether it’s Stuart Webber’s appointment at Norwich; Rangers pursuit for a new head of football operations; the emergence and success of Ross Wilson at Southampton; or ‘the Monchi move’ – the Sporting Director movement is gaining momentum. Whilst popular in Europe the role was often greeted with scepticism in Britain, but now it appears to be a panacea, curing all football clubs of their ills. Our question is, where do you find a Sporting Director for your football club? We ask this because we don’t believe clubs are exploring all the available candidates, and as a result, the best talent available for such positions might be slipping through the recruitment net. In a much cited academic paper on network connections, Economic Sociologist Mark Granovetter (1974) provided evidence that employment markets, such as finding Sporting Directors (or any kind of talent such as players for that matter), does not work as free and open competition, as laid out in neo-classical economic frameworks. That is, any pursuit for talent depends on established ties to others; and behaviour is influenced by their social relationships. In the case of the role of the Sporting Director, it is typically owners and CEOs that use their personal network to make contact with (i) potential employees, (ii) intermediaries and (iii) recruitment agencies. However, within the everyday working environment of the owners and CEOs, they often rely on a network of strong ties/connections. Why is this problematic? Individuals who share strong ties to one another tend to be very similar in nature (the technical term for this is homophily). Because of these strong ties, there is a significant amount of trust invested in the network and a source of what Sociologist Robert Putnam termed ‘bonding social capital’ (social networks between similar groups), which facilitates shared social norms, cooperative spirit, and trust. Trust is important in this context in many ways, especially guarding against unethical or mischievous behaviour. Networks of strong ties are important not least as a support mechanism. Yet because of the nature of these strong ties, information (such as insight and recommendations on talented prospective Sporting Directors) which flows through the network tends to be often redundant as it is circulated many times. For example, if a juicy bit of gossip is being communicated through these strong ties you are likely to have been told it many times. As such, whilst searching for a Sporting Director, a CEO or owner might overly rely on these strong ties resulting in the same information on the same names and faces, many times. Moreover, there are examples of where the same people are moving around the identical or similar roles. In many ways one shift in the football pyramid of Sporting Directors, whether a transfer or sacking, creates an interconnected cascade effect of changes. However, it is clear from evidence we have collected, that recruitment agencies offer owners and CEOs similar names. This is not to say that those individuals currently occupying, or who continue to be associated and forwarded for the Sporting Director role are not excellent executives or fit for purpose. But it does mean that owners and CEOs are overlooking a (perhaps better) wealth of talent in the recruitment and due diligence process, simply as a result of being constrained by their network. Who can blame owners and CEOs, they are working with a tinderbox marketplace, and relying on networks of trust is a rational choice, given the circumstances. They are already under significant pressure to lead a football club, without the added burden of (re)searching the football industry to find the best candidate for their club! However, this reliance on strong ties is also how much of football operates, whether finding players, managers, sport scientists or medics. As a result, owners and CEOs seek out recruitment agencies they trust to help find them talent. In this respect, it is fair to say, recruiters could do better. Many in football reading this will acknowledge that key people, have the skills to do the Sporting Director role but don’t get considered. The role of acting as guardian over a football clubs sporting strategy is demanding so there is no surprise. To move forward, we must return to Granovetter. 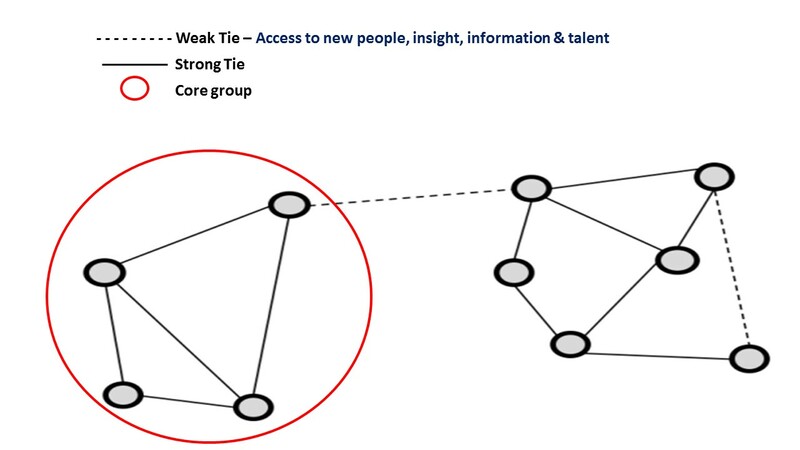 On the flip side of his research, evidence shows that it is in fact weak ties (ties to others outside the core group that reach out to other networks – see figure below), which are advantageous in economic activity, such as recruitment. For Granovetter, these weak ties are a source of novel information and new network flows. These weak ties can be advantageous because they bridge networks introducing new people, ideas, insight and information, that are otherwise unknown. It is these weak ties that have strategic importance. What does this mean for future Sporting Director recruitment? Placed in the context of the Sporting Director, it means owners and CEOs (and recruitment agencies) whilst continuing to utilise their strong ties, must also explore avenues away from their core connections to uncover new people and talent capable of delivering successful sporting strategies in football clubs. Over the past few months, we have increasingly connected with leaders and influences in the football industry (including owners and CEOs) seeking to recruit the right talent, specifically for the Sporting Directors role. We found that these leaders in the football system are capitalising on weak ties to deliver new people, ideas, information and insight to inform decision-making and recruitment. This is not the status quo. Our challenge to those involved in the recruitment of Sporting Directors, is to not abandon their strong ties, but to also capitalise on their weak ties. To reach out to unexpected connections and to consider casting their recruitment net further to find the existing talent in the industry. Talent who possess the capabilities and who now need the opportunity to break into this often closed environment and prove their worth. Previous Interview: Is Stuart Webber the right man to turn Norwich City’s fortunes around?